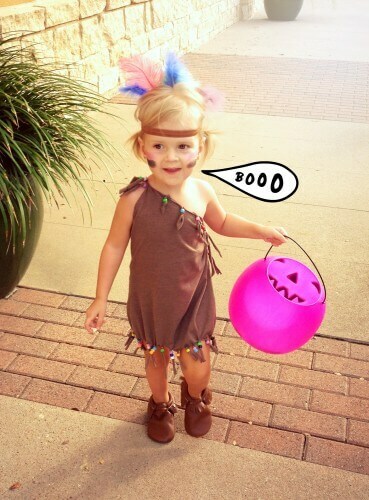 I have a SUPER EASY, no sew, DIY Halloween costume tutorial for you guys today. This is best suited for children’s costumes, unless you wanted to cut your shirt and have a midriff and short skirt, which I don’t recommend. 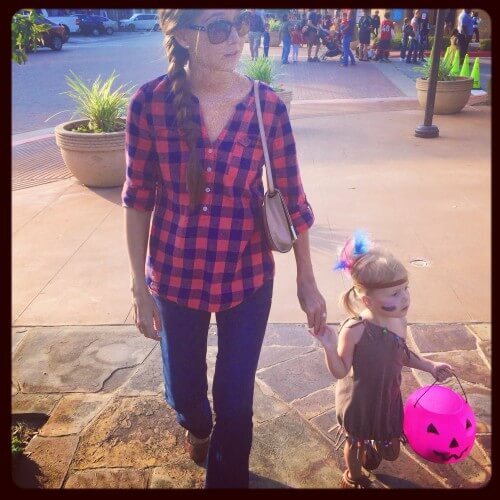 Let’s not use Halloween as an excuse to wear 3/4′s less clothing. Cut 3″ slits every 1-2″ along the bottom. 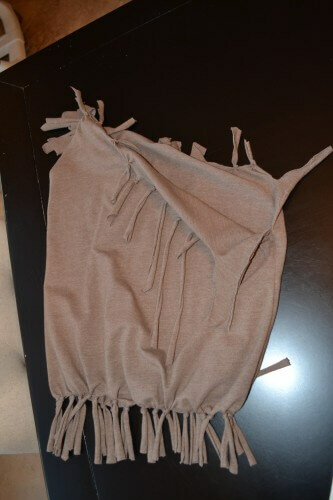 Tie a knot at the top of each piece of fringe. Pull and stretch each piece to create thin, curled strips like mine. Cut off the sleeves of your shirt. 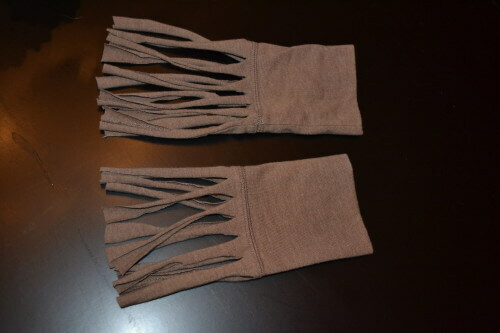 Save the sleeves if you plan to use them as shoe covers. 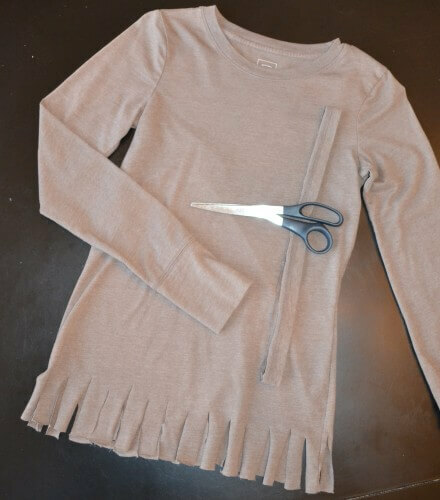 Lay one “sleeve” back up, and leave the other sleeve down to create a one-shoulder look. 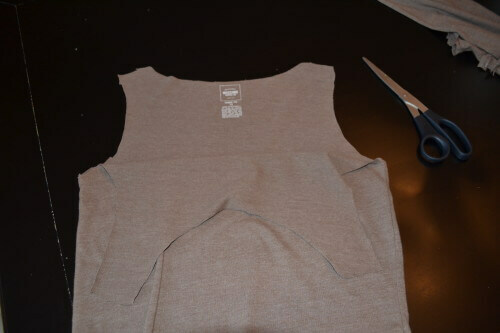 Cut the folded over material into strips, and repeat on the back of the shirt. Tie knots at the top of each strip, as you did along the bottom. 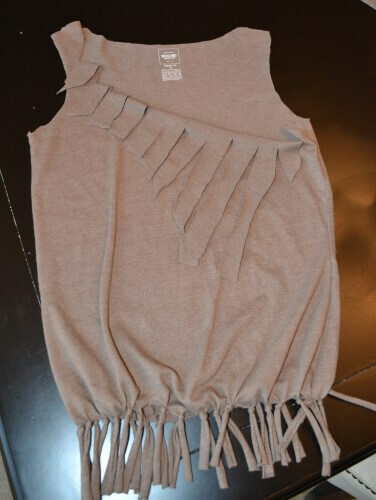 Tie two pieces of fringe together on the left side to create a shoulder strap. 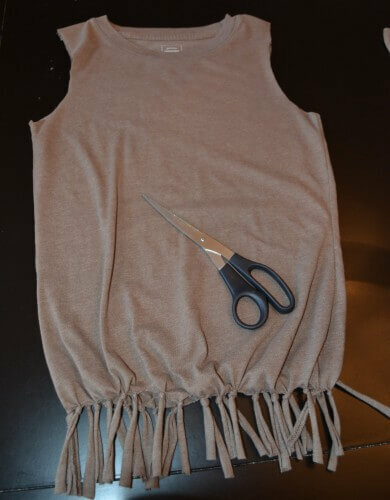 You will tie the right side of the dress together (under your child’s armpit, if you want a one-shoulder strap look) after the dress is on, which will allow you to customize the fit. 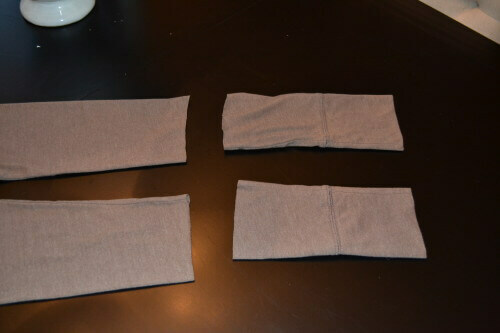 Use the bottom hem that you saved to make a belt. My daughter doesn’t have long enough hair for “Pocahontas braids”, so I gave her pigtails instead, and threw on a brown headband. If you don’t have a headband, cut a strip from your leftover shirt scraps, and tie one on. If you do not have “Indian themed” shoes, don’t worry. 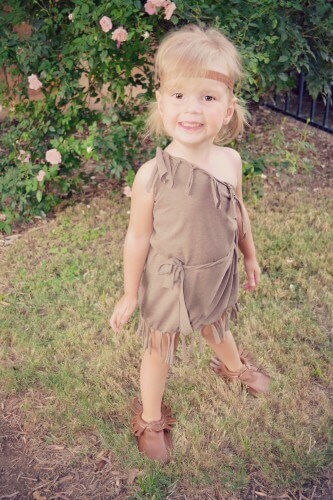 You can use the leftover sleeves, cut slits in them, and tie them around your child’s ankles to create a fringe over ANY pair of shoes. Slip those bad boys onto your ankle, and viola! You could wear these over any pair of shoes, or flip-flops. I already owned the shirt, so this project was 100% FREE for me, but again, Michaels sells basic shirts in a variety of colors for very, very cheap. 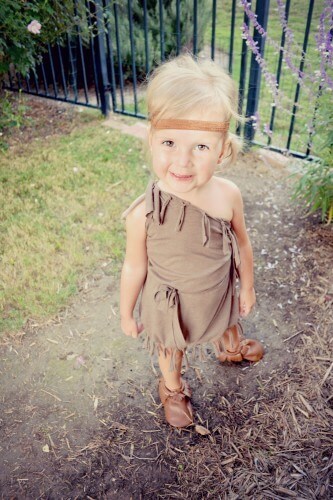 You could substitute the brown shirt for lime green and make this a Tinkerbell costume, or use an orange shirt for a Flintstones inspired outfit as well. Camryn decided she wanted to add feathers to her headband, and beads onto each piece of fringe (which was a long and tedious job for mom) so here she was at our local Halloween festival wearing her colorful version. Do NOT try to steal a girls chocolate. The beads and feathers only cost me $4 at Michaels, and I have a TON leftover for future projects. She’s still insisting on being Buzz Lightyear Halloween night, and is making my husband and I be Jessie and Woody, and our dog is Bullseye. Should be interesting. Hope you all enjoyed this quick and easy, last minute Halloween DIY ! What are y’all dressing as for Halloween? 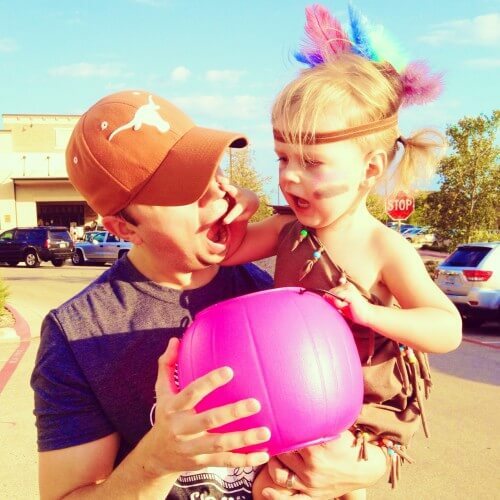 Maybe we should do a contest on Facebook, and y’all can submit your costumes, and we can all vote for our favorite. Any prize ideas? Leave me a comment below with your ideas!